Frooti (Mango Juice) is a popular brand in India created by the makers of Parle-G which is an another popular biscuit brand of India. 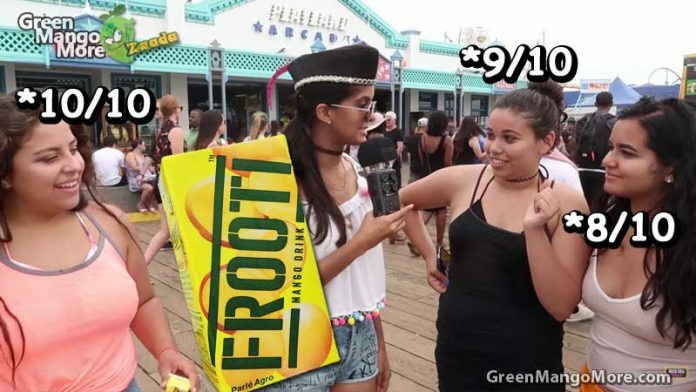 In India there is a huge demand of Frooti and that is why a popular youtuber called Rickshawali came up with an idea to share this awesome taste with Americans. Check out this video where Americans trying Frooti for the first time and how the reacted to its taste. Most of them liked it a lot with 9/10 rating with joyful expression. Previously Rickshawali also did the same survey with Hajmola (Tangy Digestive Tablets) and many other funny surveys. You can watch more videos of Rickshawali on her YouTube channel, Here. Previous articleMohammed Shami Got Angry on “Baap Kon Hai” Remark By a Pakistani Fan.